The weirdest of antiquities trafficking stories. This morning a friend of mine sent me a press release put out by Brown University. The title reads 13th century Maya codex, long shrouded in controversy, proves genuine. I knew they could mean only one thing: The Grolier Codex. “Not today,” I said, “I have other things to do”! But resigned to my fate, I got a copy of the article in question thanks to one of the authors, Prof Stephen Houston. Perhaps ‘resigned’ isn’t the right word. Maybe more ‘so very, very excited that I knocked everything else off my desk and spelled “Grolier” wrong a hastily mashed out email’. Why? Because this possible/probable Maya document bears one of the most absurd and unbelievable looting stories of all time. I won’t go into the whole tall tale again as I cover it in the blog post Maya artefacts and Mexican bandits: trafficking tall tales. It’s an absurd, adolescent bandito fantasy filled with blindfolds, mysterious air strips in the jungle, and surly ‘locals’. I don’t believe it. Yet, just because someone made up a ludicrously odd origin myth for the Grolier Codex doesn’t mean it’s a fake and doesn’t mean that some essence of the story is true. The issue, of course, is that even if the Grolier is real, because it was looted and trafficked, there will always be doubts. If it had been found by archaeologist or if archaeologists had been contacted regarding the chance discovery, we wouldn’t be in an authenticity mess. Ultimately, after an analysis of the nuance of the depictions of deities in the Codex, they ask the question “Could the painter of the Grolier have lived in the 20th century?” Based on the evidence they collect, they answer it with a “no”. Much more to be had in the article, totally worth taking a look, although you’ll likely have to read it within the Mesoweb publication available here. The answer to that question doesn’t really matter. I don’t like that we even have to spend time on the topic. I want to just enjoy the contents, not have to argue about reality.Irrespective of the loss-of-contextual-info problem, authenticity questions are a terrifying side effect of the market for antiquities. Yes, the market for antiquities brings objects to light but almost always at a much higher cost than they’re worth. We lose our ability to tell what is real and what is not. 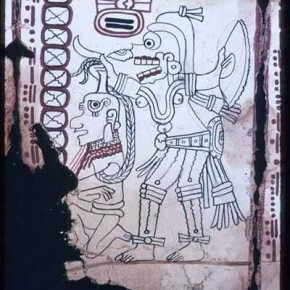 In the case of the Grolier Codex, which may only be the fourth Maya book to survive the purges of the Spanish Conquest, we’ll always have this lingering doubt. If there is a chance that it’s the work of 20th century forgers can we ever really let it in to our corpus of understanding of the Maya? If it is authentic, isn’t it a true shame that many will never accept it without significant doubts. Even with the artefact there, sitting right there before us, our ability to understand the past from it is compromised simply because it was looted. Not the first time that I’ve had cause to thank Prof. Houston and probably wont be the last. Coe, Michael D., Mary Miller, Stephen Houston, and Karl Taube (2016), The Fourth Maya Codex, Maya Archaeology 3, (Precolumbia Mesoweb Press).